Being able to take care of yourself mentally, financially, and physically as a female traveler is refreshing and something we all want. However, for a lot of solo female travelers, the physical part only applies to exercise. Rarely, will we find ourselves thinking about the benefits of self defense classes. Yes you’ll add yoga, if you’re a yogi, to your travel itinerary or ensure that you have a gym membership or a home workout plan no matter where in the world you find yourself. Because physical fitness is important to you. But have you ever thought that you could be able to physically take care of yourself in terms of safety while still taking care of your body? Knowing that you can protect yourself in all situations will boost your confidence twice fold. By taking a self defense course you don’t only learn the basics of self defense, you also get to stay physically fit. Not convinced yet? Read on. One of the biggest fears that hold most women back from traveling alone is lack of confidence. How will I be able to tackle the world alone? We often wonder. At the back of your mind is the worry about your security as you travel alone. One of the major benefits of self defense classes that most students, myself included, report, is the confidence you feel once you complete a self defense course. Many of us are not so confident of our abilities to protect ourselves. Self defense classes, however, are a great way to build confidence in yourself. Nothing gives you confidence than knowing you are capable of doing something. So no matter where you travel to after a self defense course, you know that you can handle anything that comes your way. During an attack, the way you move will determine how much power you give the attacker. Movement is very important during an attack because it shows the attacker that you are ready to defend yourself. Participating in a defense class will help you learn how to develop your reflexes in order to gain a fighter’s reflex. This means that you become physically conditioned to deal with a dangerous situation in the most appropriate way. The fighter’s reflex gives you the power to move quickly and strategically during an attack. It gives you the ability to know where to hit and where to step without having to stop and think. This will definitely catch your attacker unaware throwing them off thus giving you more power over them. 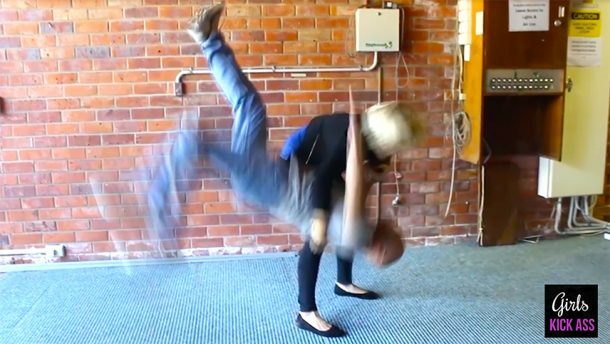 -> Check this out: Self-defense training 1:1 – What is self-defense training? Another big worry about traveling alone is safety. Self defense classes for women will teach you how to physically protect yourself and fight off an attacker. Knowing how to defend yourself will make you feel safer and less anxious about your safety as you globe trot alone. When you take a self defense course you will learn all the basics of how to identify and quickly overcome an attacker so that you can escape from any form of physical attack. One of the advice you will always get from seasoned solo travelers, both male and female, is that you always have to be aware of your surroundings. It doesn’t matter whether you’re in your home country or in a foreign country. Being aware of your surrounding is one of the best ways to stay safe. Self defense classes help to enhance your awareness of your surroundings. You can be attacked anywhere, any time. You never plan to be attacked, so you must always be on the lookout in case anyone is planning to attack you. Self defense classes teach you what to look out for, the tell tale signs of an attacker, ways to avoid being a target and so on. A boost in your social skills is a huge benefit that cannot go unnoticed. As a solo traveler being able to interact with strangers can change the course of your journey. But unfortunately there are many shy and scared travelers. Others simply have no social skills. When you take a self defense class, you’ll most likely be part of a group. You therefore get to meet new people and consequently develop your social skills. You also get to learn important social interactional skills such as discipline, respect and tolerance among others. These skills will definitely come in handy as you travel the world. Self-defense not only works on your physical well being but also on your mental and general wellness. Besides the physical moves, a defense class will teach you how to develop self-discipline. To succeed in a defense course, you need discipline. You have to be dedicated and attend classes faithfully. You need to show up in class and keep practicing. With time you develop unmatched discipline. By taking defense classes you learn how to be focused and you will always take your personal safety seriously. This is something that travelers find to be of great use as they travel the world. Most self defense methods are centered around trust and respect. You are taught to respect yourself and each other. Self respect and respect for others is a principle that applies in life too. During your classes, you will be practicing your moves with a partner. It’s important that there is mutual trust between the two of you. You both need to trust that no one will hurt the other. When it comes to travel, trusting in yourself or your travel partner will translate to a successful and enjoyable trip. However, if you keep second guessing yourself you may ruin the fun. Join our self defense course and see for yourself that it can only help you rip these and more benefits of self defense classes. When it comes to protecting yourself, you certainly don’t want to bargain on it! Are you interested in a self defense course? What would you like to achieve from the classes? Share your thoughts in the comments section.